October is just a few days away, which means Major League Baseball playoffs are almost here. Leading up to these playoffs is a race for the American League wild card spot, currently tied between the Boston Red Sox and the Tampa Bay Rays. In the beginning of September the Red Sox had a nine game lead in taking the wild card spot in the playoffs, but some depressing losses since (yes, we are headquartered in Boston) have kept baseball fans on the edge of their seats. Two games remain in the regular season, and if the Red Sox and Rays are still tied after these games they will play this Thursday at Tropicana Field to determine which team secures the wild card spot. Given all the nerves here in Boston, we dove into our Facebook advertising platform’s campaign data to compare each team’s fan base and reach on Facebook. When it comes to the number of people on Facebook listing interest in each team on their profiles or Liking their pages, Red Sox Nation pulls out on top with over eight times the reach. Red Sox fans are spread out across the nation more so than Rays fans, with 22% located in Massachusetts as compared to 68% of Rays fans being located in Florida. 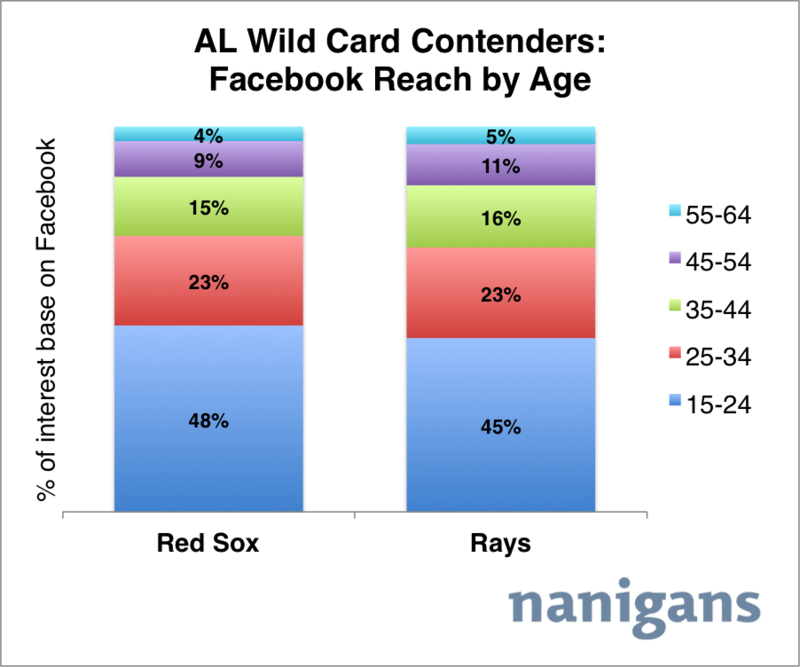 The only state with more Rays fans than Red Sox fans on Facebook is in Florida. Nonetheless, and likely due to the state’s large population, Florida is one of the top five states with the greatest number of Red Sox fans. 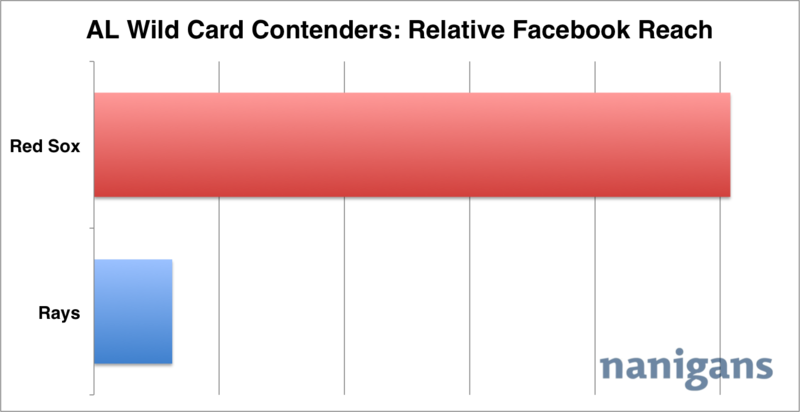 The age and gender composition of the two teams’ fans on Facebook are very similar. 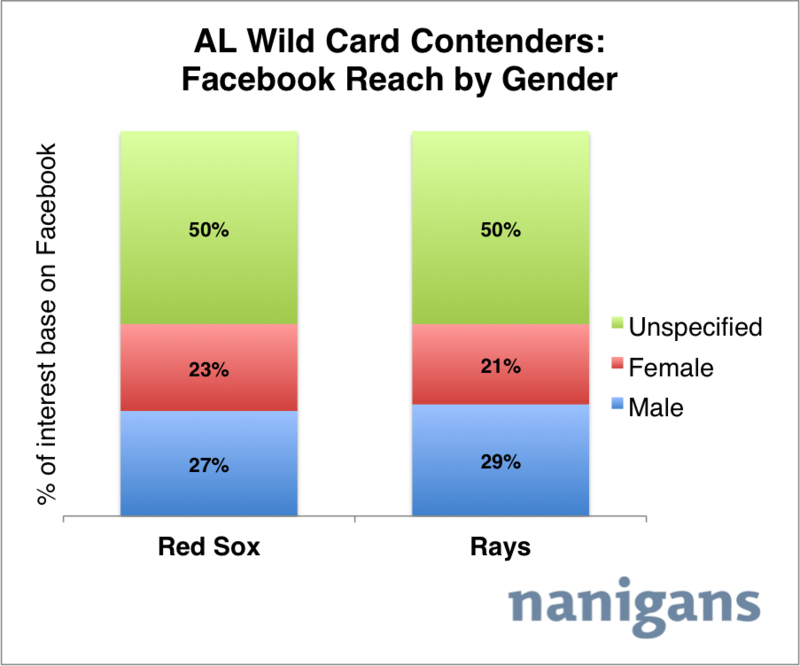 A slightly larger portion of females and a slightly younger fanbase overall cheer on the Red Sox as compared to the Rays.